Lease Cancellation Agreement: What Is It? A lease cancellation agreement is used to end a current lease before its contracted end date. 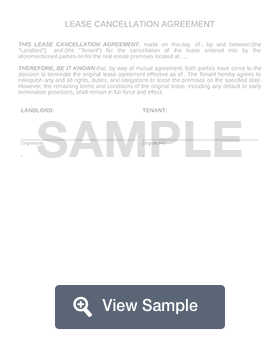 The tenant or the landlord can initiate lease cancellation with this document. This document will allow either party to present their case for early cancellation while protecting the legal rights from the original lease contract. This document will need to include information about the tenant, the landlord, and the property. The contact information for both parties should be listed, as well as the address of the rental property. The current terms of the lease should be outlined, as well as the new cancellation date. Any early cancellation penalties should be included on this agreement and both parties should consent to this penalty before signing. Create a free Lease Cancellation Agreement in minutes with our professional document builder.